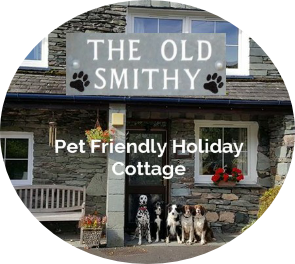 This pet friendly 3 bedroom holiday cottage is a ground floor apartment with an enclosed garden located at Grisedale Bridge between Glenridding and Patterdale by Ullswater in the Lake District. 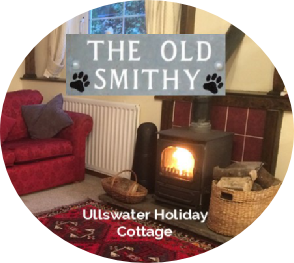 The cottage sleeps 5 in a double, twin and single bedrooms. - All sharing one bathroom. Pets are welcome. Free WiFi. The 3 bedrooms are all cosy and comfortable. There is one double room with a standard double bed, one twin room with 2 standard single beds, plus room for a travel cot if needed and one single room with a standard single bed. All have a small amount of space to hang or fold clothes and belongings. A few hangers are supplied. There is also a hairdryer in the double room. The bathroom has a toilet, sink and a bath with a shower over. There is a shaver plug near the mirror. The large kitchen/diner is L shaped and opens into the enclosed garden. The room is a tiled floor and can be shut off from the lounge with childgates so dirty/damp dogs can be contained. There is a fridge/freezer, washing machine, double oven, microwave and dishwasher. It is also well equipped with kettle, toaster and plenty of utensils and dishes. There are also dog towels and a ‘paw washing’ bowl. The lounge is very cosy with a woodburning stove with one night’s supply of wood provided. There are 2 sofas and a chair seating 5 people comfortably. There is a TV with SKY freeview & DVD player. Throws are provided to protect the furniture from dogs. Wifi is also available free of charge. The garden at the rear is mostly grass and is accessible round the side of the house from the front. There is also a door directly into the kitchen/diner. Useful when you and the dogs are wet and/or muddy! For information please call Sarah on 07799 520206 or send us an email. .